Birmingham is the second multi-cultural city after London. But multi-cultural in a different way: while there are over 300 languages spoken in London, the most diverse city in the world in terms of nationalities, migrants’ origins are skewed towards just a few source-areas in Birmingham. 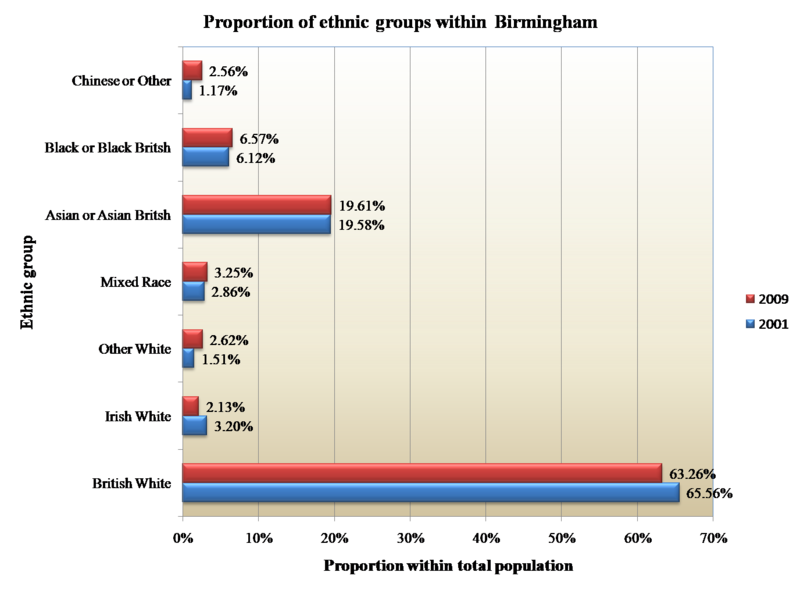 Most migrants or nationals with foreign parents are from Pakistan-Punjab area, India, Caribbean Islands, South – East Africa, Bangladesh, Afganistan, Ireland and more recently Poland and China. Historically, foreigners came to Birmingham area because of the large offer of jobs in industry, good transport connections (the airport, built in 1939 and expanded to become international in 1966 is the 5th largest airport in the UK) and because of family and friends already settled here and able to support the new entrants in carving out a living. Another unofficial rumour among certain categories of low skilled low educated migrants is that it is easier to obtain social benefits (be them related to housing, unemployment or disability) than in any other area in the country. A sensitive and not enough researched topic, but the clear thing is that the city has the second largest rate of benefit claims in the country. In the ‘50s and ‘60s increasing numbers of immigrants from Ireland, Pakistan and the West Indies settled in poor areas around the city centre. Many worked in roads and buildings construction in the Birmingham post-war rebirth. 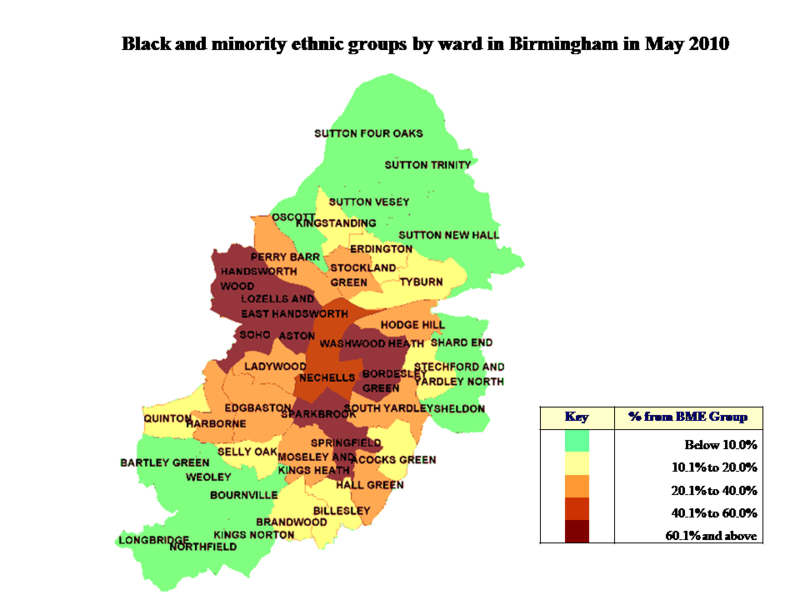 In those days Irish were the largest minority in Birmingham. Digbeth area, bordering the very city centre, became famous for its Irish pubs and shops. 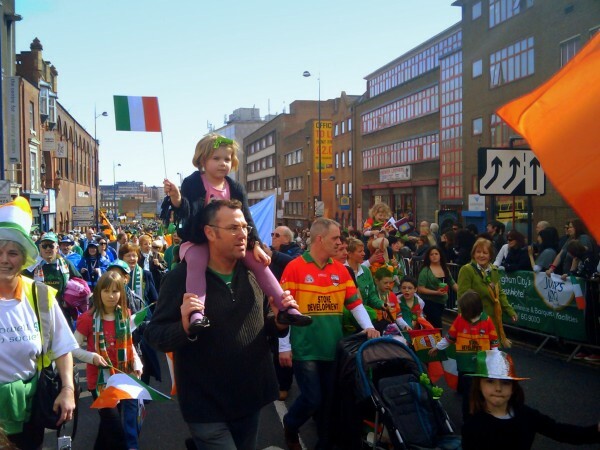 Even today one of the biggest festivals of the year is St Patrick’s Day, celebrated with epic parades, Irish music, Guiness and green hats on the 17th March. The Irish community here is the largest in the whole of England. Later on in the ‘60s and ‘70s many African Asians arrived chased away from East Africa by dictators such as Kenyatta of Kenya or Idi Amin of Uganda. Over half of those expelled from Africa held British passport and had the right of entry and abode. Although the biggest influx of refugees came at a time of economic crisis and unemployment in the late ’70s and early ’80s (hence plenty of public hostility against immigration), the government managed to settle immigrants. They were needed to fill job shortages for bus and taxi drivers, factory workers and so on. Many of them worked in manufacturing, construction and automotive industries on which the city used to rely but many of their elderly and disabled survived on welfare state benefits. In the ’80s young people found employment in the catering and service sector. After all it seems that despite cuts in spending on housing and stricter eligibility rules for benefits, Thatcher’s revolution was less radical than it was claimed – I wonder what is going to happen with today Cameron’s and Conservatives spending cuts reform? Birmingham has now one of the largest Pakistani communities in the world and their roots can be traced mainly to Kashmir and Punjab. There are also many Indian, Bangladeshi and Afgani and I’m tempted to say that all taxi drivers in the city are of Pakistani or related stock, but obviously that cannot be entirely true. In more recent years Birmingham received an inflow of Polish, working mainly in low paid unskilled jobs, although some of them might hold good education degrees from their home country. However the onset of the economic crisis in 2008-09 followed by the sterling drop made over 30% Polish in the area return home to the almost recession-proof Poland. Chinese and other south-east Asians are another rising group and although their numbers are much lower than other ethnic groups, they more than doubled in the 2001-09 period according to estimates of the Office for National Statistics. 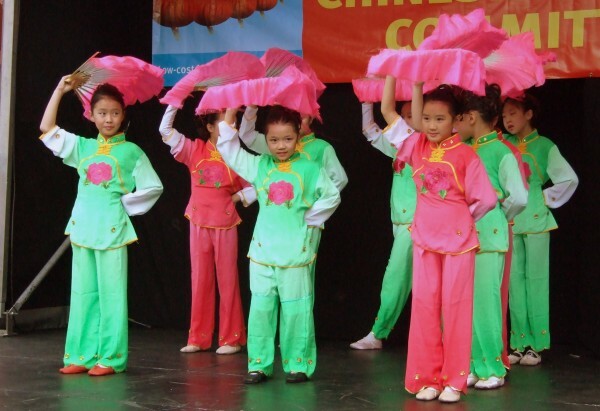 Some parts of Digbeth and the Arcadian Centre have many Chinese residents, shops and eateries and the Chinese New Year is always celebrated with fast. More than one third of the registered population belonged to an ethnic group other than White according to the data represented above and the trend indicates that Birmingham will become more and more colourful over the next years, especially as more people will want to flee from conflictual, freedom-proof or poverty stricken regions from Lybia, Zimbabwe, Somalia, Kashmir or Iran. More than that, if I am to be picky I’d say the above figures are only based on experimental data from the Census and other similar reports. I would imagine that many of the poorest, most deprived and illiterate (not to speak of the illegal) migrants won’t know or won’t want to register themselves as residents, therefore being left out of the official count. A worrying aspect is that Birmingham’s population suffers from lower levels of qualifications than the national average and when compared with other major cities such as Manchester, Liverpool or Sheffield. 20.7% of its working age population have no qualifications compared to only 12.3% England’s average and a lower percentage with higher qualifications – only 23.5% compared to 28.7% nationally. The worklessness and unemployment rates are particularly high in some areas of the city which is not surprising as unskilled workers experience greater disadvantage during periods of recession (such as the present one) when the jobs are fewer and harder to get. Worklessness is a larger indicator than unemployment because it comprises all those who are economically inactive: sick, disabled, students, people looking after the family and home, retired. It measures those who are claiming out of work benefits like Jobseekers Allowance, Incapacity benefits, Income support and others. Just to get an idea – in August 2009 the worklessness rate in Birmingham was 20.4%, the second highest in the country after Liverpool while the country’s average was 13.2%. 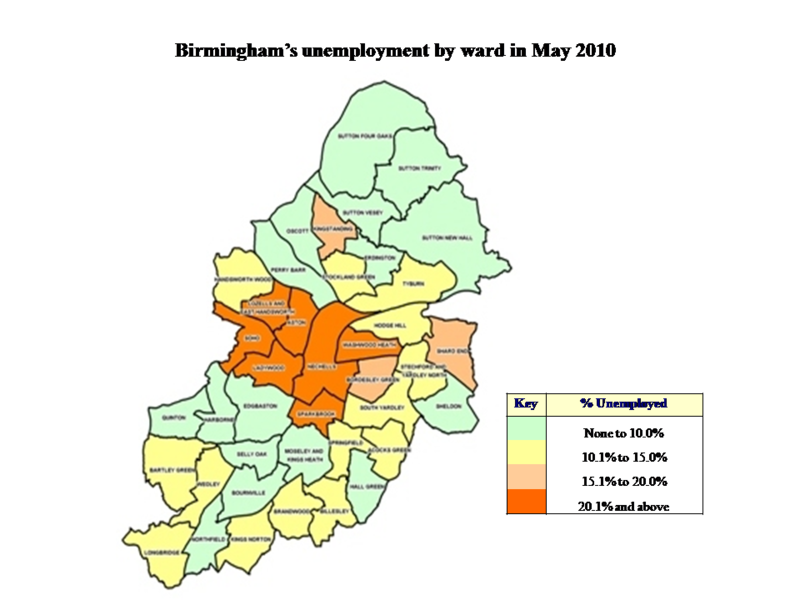 Between January 2009 – January 2010 the seasonally adjusted unemployment rate in Birmingham was 12.9%. People living in areas of Birmingham where employment rates are low also tend to experience low living standards – it is all a large scale domino game where low skills and education trigger low earnings which trigger poor housing in bad environments which could induce stress, bad health and anti-social behaviour let alone increasing crime rates. It is not surprising then that the August riots took such a bad turn in Birmingham, the city with the highest number of casualties – 3 British Asian were killed by a car driven by suspected looters and many shops and businesses in the city had their windows smashed and were ransacked by rioters. 1000 people had been arrested after 4 days of riots. Causes seemed to have to do with racial hatred, economic hardship enhanced by the recession and an easy opportunity for deprived categories to steal goods from food and basic toiletries to luxury products. Over £500,000 damage occurred on a single day to Emporio Armani in the posh Mailbox shopping centre while some looters’ predilection for stores such as JD Sports, Primark, McDonald’s or Aldi might offer some hints about their social and ethnic backgrounds. 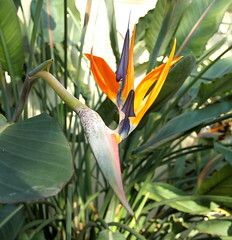 Also about their basic needs struggle and deprivation. Deprivation refers to wider socioeconomic problems caused by a lack of resources and opportunities, to poverty, hardship and in general poor living conditions. Different types of deprivation include poor income, housing, employment, access to services, education, health, community safety and physical environment. The indices of deprivation 2010 published by the Department for Communites and Local Government show that Birmingham suffers from high levels of deprivation, with 40% of the population living in the 10% most deprived areas in England and is ranked the third most deprived among big cities (after Liverpool and Manchester). Many wards such as Washwood Heath, Sparkbrook, Nechells, Aston and others are all in top 10% worst areas in England and they have also the highest numbers of Asian and Black minorities. Not surprising as deprivation is linked to unemployment and lack of education and those wards score high in terms of unemployment too. It can be seen from the two maps below that the pockets of high unemployment have also large percentages of black and Asian minorities. Sparkbrook for exemple was 80% non-White at the 2001 Census and this figure is likely to be even higher when the 2010 data will be released. Employment rates and skill levels are particularly low for the Pakistani, Bangladeshi and African-Caribbean communities. Some of the explanations I can think of lie in the fact that these minorities have mostly arrived from poor or conflictual areas, in search of a better life but the majority were unequipped with high education, skills and financial means. And how could they be if schools in their home countries are run down, some lacking electricity and water, access to information is banned and their average monthly earning might be the equivalent of a couple hundred pounds or less? The average yearly salary in Bangladesh is less than £1,400 (about 2200$) and in the war torn Somalia the medium yearly income is even less than £400 (600$). Britain has a fairly young population compared to many European countries, especially Germany who is ageing the fastest. Birmingham is one of its youngest cities which has so far benefited from the ‘baby boomer’ generation of the post-war period (’50s and ’60s) with the particularity that its “baby boom” continued also in the ’70s. In more recent years social issues such as increasing teenage pregnancies and unsustainable birth rates among the poorest social categories of migrants have at least kept the city in the top youngest areas. Official data show that the number of births to mothers who were born overseas is increasing. If in 2001 there were 30.5% of birth to non-UK mothers, in 2009 there were 38.7%! Most of these women are from Pakistan, Bangladesh and India and also from Zimbabwe and Somalia. At the moment almost 54% of school pupils are non-White and the government is making efforts to get most children from socially deprived families into schooling so as to integrate them into the active work force in the future. It is for sure a noble but difficult aim: poor education at home, poverty reduced lone parents, violent or drug and alcohol addicted relatives, rough environments, financial struggles that may impose a bad diet and consequent health problems, all these can have a very negative impact on the child’s upbringing and school performance. However the authorities are hoping to develop a successful system of apprenticeships and increase jobs in advanced manufacturing and engineering, automotive sector and services. The city also benefits from the ranks of students moving here for one or more years and who make it feel more alive and energized. Therefore Birmingham has a higher number of new graduates per 1000 people of the working age population (28.7 in 2008), compared with the West Midlands (12.8) and the UK (14.3). 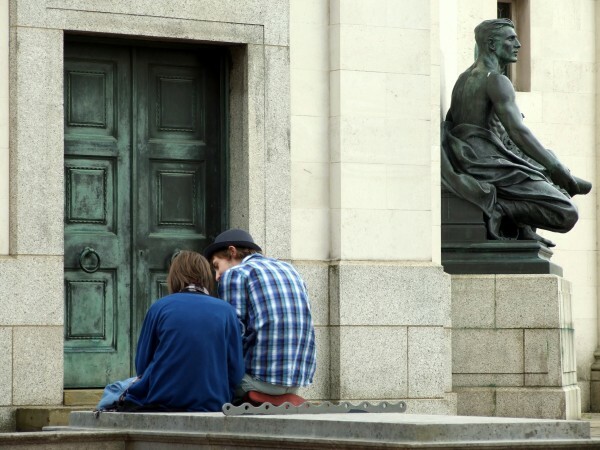 This is because of a number of reputed universities producing large numbers of graduates every year: the University of Birmingham, Aston University or Birmingham City University. Unfortunately there are still not enough highly skilled jobs in the area to allure these youngsters. They tend to leave, mainly for London which appeals to them not only in terms of work prospects but also because of its numerous cultural attractions and cosmopolitanism that Birmingham tends to lack. Shall we go or shall we stay? Is Birmingham menaced by out-migration over the next years?